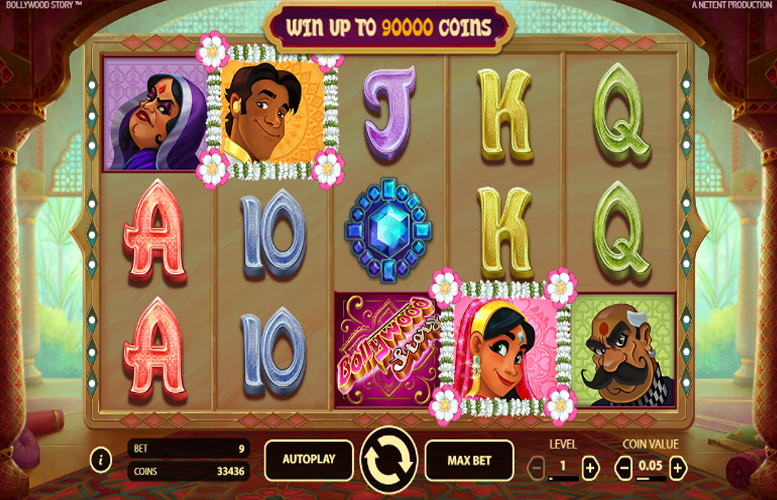 The Bollywood Story slot machine by Netent pays homage to the wonderful world of Bollywood cinematography. It comes complete with stylish artwork, a great Eastern soundtrack, and an incredibly juicy free spin mode. The game won’t be to everyone’s taste (there’s a distinct lack of explosions that might put some people off). It’s also lacking a true second screen bonus. This is a shame given that Bollywood cinema is so full of colour and drama. We’re sure Netent could have come up with something relevant to take the action away from the reels! 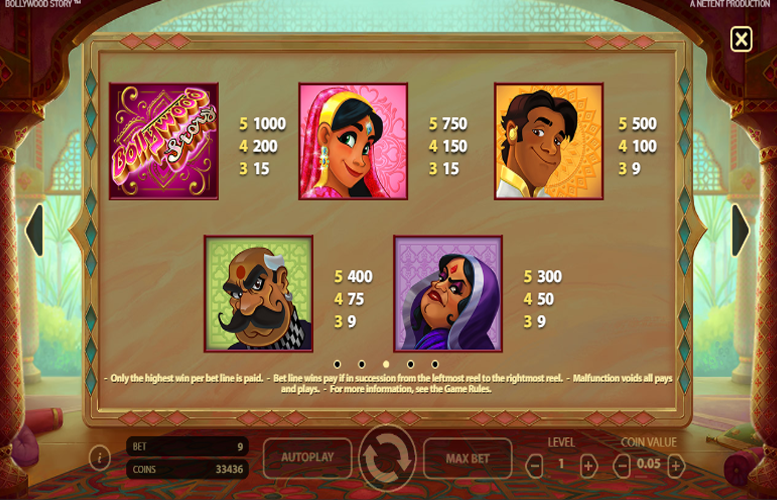 Authentic music and art style give this slot a real (albeit cartoony) feel of a classic Bollywood movie. We love games that award large numbers of free spins and Bollywood Story is one such slot. Hitting 30 free games as good as guarantees you some juicy prizes! Not a huge amount of variety in the game features. This one is more about hitting the top jackpots and not so much about slowly increasing wins through various side games. Fans of action-packed slots might find the gameplay on this one a little lacking. It’s one that will likely divide opinion. Lack of second screen side game feels like a bit of a missed opportunity. With so much strong imagery associated with Bollywood, we’re sure a greater effort could have been made to develop the characters featured in the game in a secondary bonus stage. Game logo = 1,000x the line bet. Girl = 750x the line bet. Young man = 500x the line bet. Older man = 400x the line bet. Older woman = 300x the line bet. The biggest possible payout on Bollywood Story is 90,000 coins – not too shabby at all. 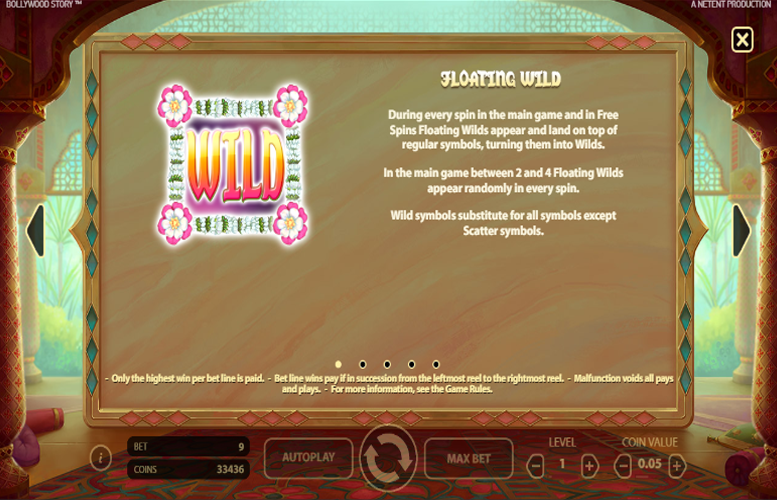 During every spin of the main game and in the Free Spins mode, Floating “Wilds” will appear and land on top of regular symbols. This turns them into “Wild” symbols. 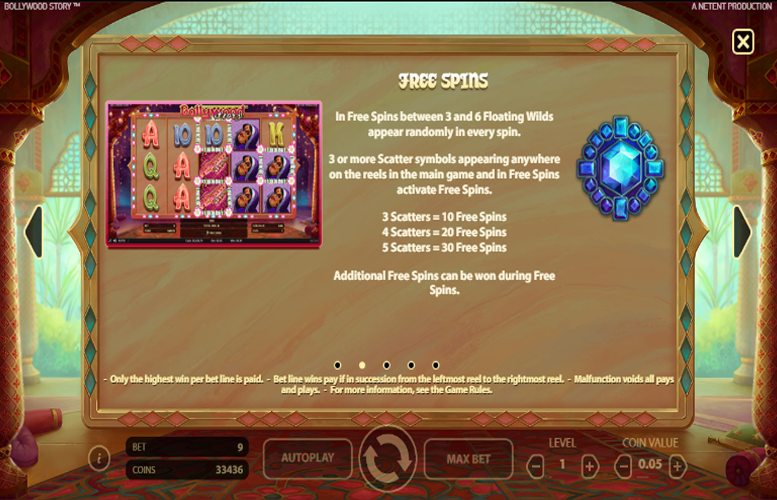 During the main game, between two and four Floating “Wilds” will appear on every spin. “Wild” symbols substitute for all other symbols except the “Scatters”. 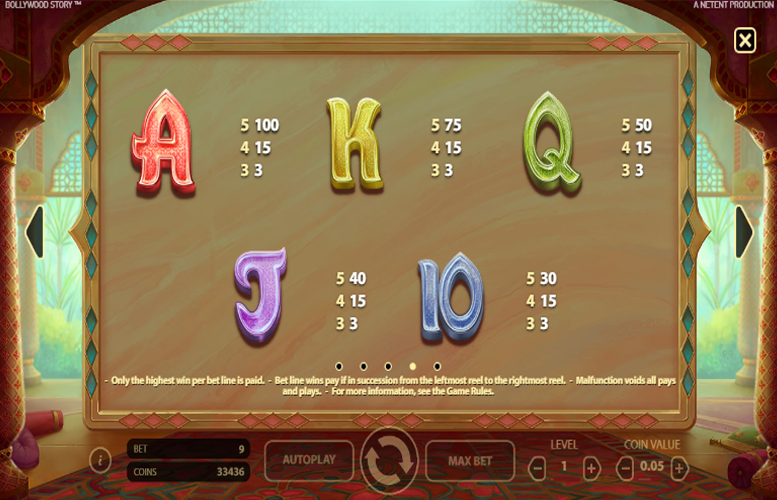 Players should note that additional free spins can be retriggered during this special feature. Since the number of win lines is fixed at 9, players are only able to adjust the number of coins bet on each line and the value of each one. They can opt for any number between one and ten for the number bet per line and a range of values between 1p and £1. This means with all values set to their minimum, the lowest possible bet per spin is just 9p. Meanwhile, with everything maxed out, the largest possible wager per turn is £90. With such an upper betting limit, the Bollywood Story slot machine will likely satisfy all but those wanting to splash the most cash. This game has a rating of 3 / 5 with 291 total reviews by the users.